After several phone calls and speaking to a multitude of people, Iuniverse finally connected me to the right person who did a full investigation of my problem with the book shipment. In case you don’t know what I am talking about click here for my previous post on Iuniverse Where Art Thou. The simple catch up is: Iuniverse sent me the wrong order and charged me all wrong. I was over charged aprox $350 for books I did not ask for and never received books I did ask for, but instead received a bunch of paperback books. I sent frequent emails in which I was told someone would contact me within 48 hours, but it never happened and follow-up emails were never returned. I was upset and starting to believe all those rumors going around about this company. I was devastated in thinking I had been duped. Two days later she called and said my purchase order was written as 150 softcover books at 45% discount with 15 softcovers free and 25 hardcovers at 35% discount is what I asked for. I agreed. She asked what I actually received and I told her 180 softcover books: 150 at 45% discount and 30 at 35% discount. She said she would call me back. Thirty minutes later she called back and said the woman in charge of my purchase screwed up and that when several emails were sent to her and my PSA that the PSA forwarded the emails to a higher up. My sales rep was summarily removed from her position for retraining but no one thought to fix the problem. So this new woman who has been looking into it apologized for the inconvenience and said she was working on a solution and would call me back. An hour later she called back and said she put in a rush order for 25 hardcover books and added another 10 softcover books for my troubles. The shipping would be free and I would not be asked to pay the difference in the charges for the hardcover (apparently I was billed less for the softcovers originally since softcovers were $17.95 and hardcovers were $27.95) which was a savings of over $100 and Iuniverse had to take the loss in cost and in shipping the new books along with giving me 10 more for free which comes to a total savings of nearly $300. I have to admit my faith was quickly dwindling and I was set to give a negative blog feedback, but in the right hands this problem was solved and Iuniverse admitted they were in error AND FIXED IT! That was all I wanted after all. So big thanks to Iuniverse, who has just been sold to Penguin, a subsidiary of Pearse, for coming through. I received my shipment two days ago and it was sent express. Now to sell all these books! Tania L Ramos is the author of When I Thought I Was Tough and Be Still. She has received to awards for Be Still, published by Iuniverse and available on Barnes & Noble, Amazon, Nook, Kindle, and Ibook. Currently working on a program to help new authors avoid the Big 3 point of view mistakes editors frown on. My son and I worked on an author interview video for awhile. We ran into a series of problems, the major being that I was very sick with pancreatitis when we did this video. Actually, the video was done several times because at one point I looked like death was beating down my door…that or I looked like the first victim of the zombie apocalypse. After many attempts we finally got this video down. This is the last day of my blog tour and I would like to thank everyone out there who has followed. Many many thanks to all those bloggers who participated in this tour. I hope you all found many more followers and enjoyed participating. Keep me in mind if you ever choose to do one of your own. This blog tour has been an amazing accomplishment for me and I have received great comments and new followers. If you would like to purchase a copy of Be Still, it is available on Amazon, Barnes & Noble, Nook, Kindle, and for Ibook. This tour is my last huge form of promotion for my book before going back into author mode. I hope to have my third family based fiction book out by Christmas and my YA alien based book out early next year. You can follow me on Facebook, Twitter, and Goodreads. Michelle Proulx, author of a new scifi book coming soon is the blog host of day 5 on the Be Still blog tour read here: Guest Blog Post: Tania L Ramos + Giveaway!. I am still in Las Vegas today, considerably more broke than six days ago, but none lost to gambling. 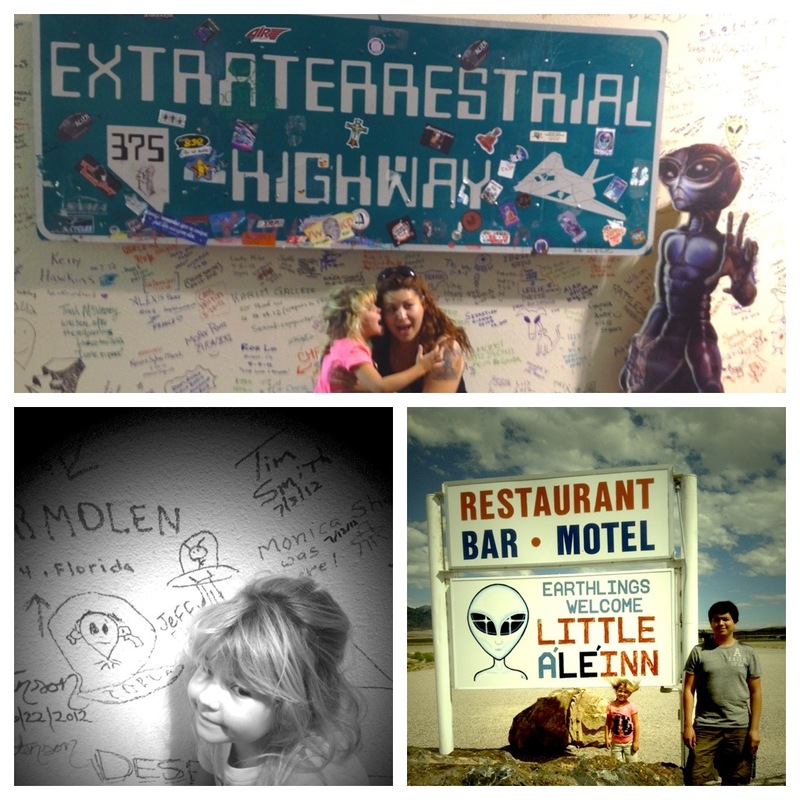 We have had a wonderful experience traveling the Extraterrestrial Hwy and stopping for burgers at the A’Li’Inn. We will definitely return–minus one five year old who was a trooper for the 6 hour round trip. I saw my son jump 855 feet off the Stratosphere hotel, had a way tooexpensive lunch at Planet Hollywood, enjoyed a day of rides at Circus Circus with my daughter while the boys went paintballing. Today we will visit the Nuclear Museaum and Area 51 museum then do a little pan handling for food. Broke!!! My blog tour is quickly coming to end and I thought it fit to end my “alien” themed vacation with Michelle who is publishing an alien themed book. See, I do put thought into things. So, in honor of all things alien and scifi today I am writing about my nerdy side. The side that has attended two Star Trek conventions and can recite every original episode of Star Trek and thought Bones was kinda cute. Then came Star Wars and my first teenage girl crush, Han Solo. I mean, what a totally hottie. I used to listen to 80’s music and enact my wedding to Han Solo. It was beautiful. Then, just when I thought all scifi hope was lost came X-Files. David Duchovny was my next crush and I just assumed someday we would be married. I was an X-Files addict except for the last season which wasn’t as awesome as the other seasons. And when that came to a roaring end I had nothing left. Enter cable television’s SciFi network and all things unexplained, yet to be discover, and mutated. I love B-flicks!!! Oh, and I do look forward to Shark Week every year…coming August 12th. So, to go back; waaaaaaay back. My very first genre of writing was scifi/horror. I think it was scifi, my mom thought it was horror. I remember my very first full length novel in 9th grade was about 150 pages long and revolved around my main character falling into a mirror and being caught in an alternate universe. After that came a story of a man who’s car broke down and got caught in a creepy mist where he met a little girl—who was dead. Sadly, these stories have all been done since. BUT, I had the ideas before anyone else and that is my claim to 9th grade fame. Being around all things alien has been very inspiring and has conjured some wonderful ideas in my head about my next story. Granted it is not all alien, there are zombies and vampires embedded but only as ambience to the story at hand. I’m very excited to start writing and excited to start reading some good scifi alien books such as Michelle’s when it comes out. Blog Tour Day 4 is moving along at full steam. Read a very wonderful and great narrative of my book Be Still here: Blog Tour – Tania L Ramos – Be Still. I met David through WordPress and have followed him for sometime as he wrote about preparing the release his own novel. Then his big day came, unfortunately I couldn’t buy his book because I didn’t own an ereader at the time, but he was kind enough to let me read a manuscript. I was quite pleased when he agreed to read and review my book for this blog tour. David has a wonderful imagination and a definite flair for words which can be seen in his writing and in this fantastic review of my book. David he said he would be honest…well everybody has professed to be blatantly honest, but I have to confess, David and I had an email conversation about having authors and book readers read our books and we agreed that authors read with a different perspective. How so? Authors know the behind the scenes stuff that every writer should be hitting along the path of the book. We read books with a different perspective, like we took off our casual reading glasses and pulled our hair up in a tight bun and placed our english teacher glasses on (I don;t think David would pull his hair up in a bun though). Maybe it was only our opinion and we are isolated in this thought, but I know it is hard for me to just read a book anymore without judging it like an editor would. How I miss the days of just finding simple bliss in turning the pages of a book and not looking to see if they told what the story is about in the first five pages, and if they didn’t head hop, and whether there was a climax half way through, and if the character made a change….etc. I kindly asked that David give me his honest opinion on the book, which he read for the first time, but if he would read it like a reader and not an author. I’m not sure which route he took, or if we can ever truly retrain our minds to go back to just losing itself in a book as an enthusiastic readers, but I think he did a fantastic job of his review and his insight. Tania L Ramos is currently on a blog tour to promote her book Be Still, available on Amazon and Barnes & Noble. Greeting from 106 degree temps in Nevada. It is h-o-t. Yesterday we had a blast visiting beautiful Freemont Street and seeing old Las Vegas. It was 100 degrees at ten p.m. But it was a great day: Dasan jumped 855 feet off the Stratosphere for his eighteenth birthday. We ate a very over-priced lunch at Planet Hollywood and later than night enjoyed the Freemont Street Experience. Why? Well, first off because it was my son’s birthday and second because I am getting ready to work on my alien book which will have a lot to do with the Nevada desert near Area 51 (go figure, right?). So I pose this question for you scifi authors (since I am going out of my genre): how much of your book is fact and how much is fiction? I want to be able to put a few fun facts in my book while maintaining the scifi element. Next question: Is scifi a form of fantasy? Or is fantasy a form of scifi? I gave myself a headache trying to deduce that one. If you say aliens I think scifi. Say unicorns and fairies and I think fantasy. But are they interchangeable? Both are forms of make believe-unless you are a true believer–but lets say for argument’s sake they are purely fiction, then an alien life form would be no different than a unicorn or fairy and would classify alien as fantasy…and vice versa, which are all forms of fiction. Oye, where is my Tylenol and icepack? This has nothing to do about anything by the way, just simple rantings of a woman suffering from heat exhaustion who has seen one to many aliens in the past 3 days and is on day 51 (ironic since I am near Area 51) of near starvation. Stupid pancreatitis and hiatal hernia! Seriously, it is like a self-lapband. Combine heat with extraterrestrial sightings and starvation and you get the recipe for an amazing scifi/fantasy novel of galactic proportions. Are they looking for us, or are we working for them? Live long and prosper and don’t forget to follow Blog Tour Day 3 at http://freebies4myfamily.blogspot.com/ with another opportunity at a free giveaway. Don’t forget to visit and like my new Facebook fan page at Facebook.com/TaniaLRamosBooks which has been updated with new photos from the road and fan photos. Tania L Ramos is the author of two books: When I Thought I was Tough (a free read & number 3 favorite on Bookemon.com) and Be Still available at Amazon and Barnes & Noble. A new family drama novel along with a YA scifi book are in the books. Tania is currently on a blog tour for her recent release of Be Still. Link to my interview by WordPress’ Nerdy Book review blogger: Author Interview: Tania L. Ramos. Day two, hip hip hooray! Today I come to you from beautiful and scorching hot Las Vegas, NV where it is my oldest son’s 18th birthday. We will be bringing in adulthood by paying for him to jump over 100 stories from the landmark Stratosphere Hotel. He may be pushed but I’ll never tell. So day two is in full effect at Nerdy Book Reviews. I met Liv via WordPress and have read many of her book reviews…even the steamy ones that make me blush. She has had very honest reviews of books and was the only true book reviewer that I asked to join my tour. I asked for an honest opinion as I have of everyone. Unfortunately, she is a very popular gal and was unable to read the book in such short notice so she proposed an interview with a review at a later time and date. I will post the review when she writes it, but for now enjoy a small question and answer session and be sure to read some of her reviews. Thanks to Liv for joining me on my tour. Be sure to click her link to read the interview and be eligible for a giveaway. My first blog tour is officially in full swing. My first tour date is today July 19, 2012. Please be supportive of all those bloggers out there who worked to put this together. What is a blog tour? 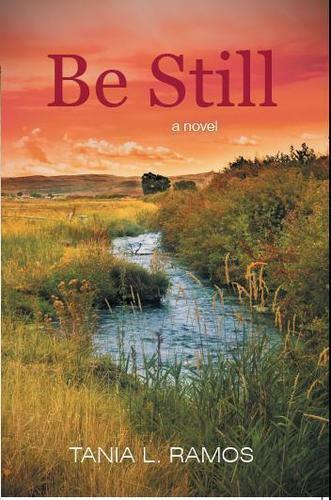 Each day a different blogger will feature a post about my book, Be Still. There will be something new everyday and giveaways. Today is opening day and will be hosted by Katherine Nader at KatherineNader.tumblr.com. Please visit her site to read an interview. I met Katherine via an iUniverse connection. We have been emailing and giving publicity and marketing information to each other which has been great since she has Canadian connections and I have California….well, sun I guess. Keep an eye out for her, she will be releasing her book, nThe Deadly Mark very soon. Tania L Ramos is an independent author who is currently promoting, Be Still, which can be purchased through most major online bookstores…and now at Chapter/indigo. Also available for most ereaders.